Texas won big Tuesday with the release of 2010 census data. Ben Philpott of KUT News and the Tribune takes a look at the numbers, which will have legislators redrawing state maps to add four new congressional seats. Texas won big Tuesday with the release of 2010 census data, which showed the state netting four congressional seats, bringing its total to 36. There's more data and more details to come, but we learned yesterday that Texas is growing, and we now have an exact population figure: 25,145,561. Mark Jones, a political science professor at Rice University, says the increase follows historic trend lines. "What it shows is there's a trend line that's positive in Texas, that we're growing on average about 20 percent each decade," Jones says. Texas added more than 4.2 million new residents since 2000, a 20.6 percent increase. U.S. Census Bureau Director Bob Groves says that since 1940, 79 congressional seats have shifted from the Midwest and Northeast to the South and West. "Texas gained the most seats this decade, a total of four — and indeed that state has gained seats for seven consecutive decades," Groves says. 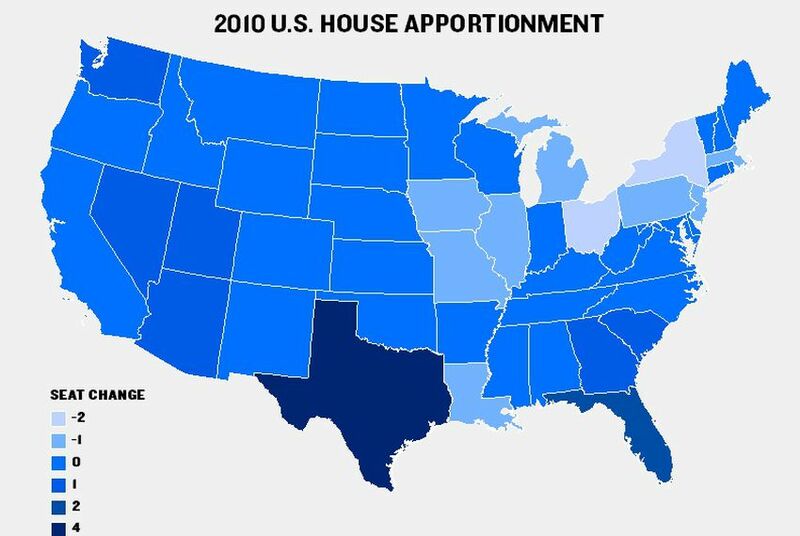 More seats means more excitement when the Legislature draws congressional maps in 2011. Ted Delisi, a Republican strategist who worked on the state's redistricting process in 2001, says three of the new congressional seats will probably land in areas that have seen the greatest population growth: Dallas, Houston and the Rio Grande Valley. After that, "the fourth seat is just a little bit trickier," Delisi says. "But it's clear that the I-35 corridor between Hillsboro and San Antonio have seen some significant growth. And I wouldn’t be surprised to see that fourth seat enter somewhere into the picture up and down the I-35 corridor." But, as Delisi puts it, mapmakers will have to put their crayons away, at least until the Census Bureau releases county-by-county numbers, when the real fun of parsing out those districts begins.